went to their rescue. Nellie nursed the sick men back to health. Next she moved to Tombstone, Arizona and opened a restaurant. Although the book says Nellie Cashman's Restaurant is still open, it closed a couple of years ago. Cafe Margarita is at that site now. This book has chapters on other women explorers readers will enjoy learning about. On a recent visit to my pool, I saw a grandmother coach her small grandson. She performed a basic freestyle stroke with her arms while standing in the pool while she kept saying "scoop, scoop." I commented to her that I liked what she was doing. "It is very good for boys," she said. "Because they perform the same movement when they play in the sandbox." Sounds like it might be good for girls too. Read Cork & Fuzz: the Swimming Lesson by Dori Chaconas. 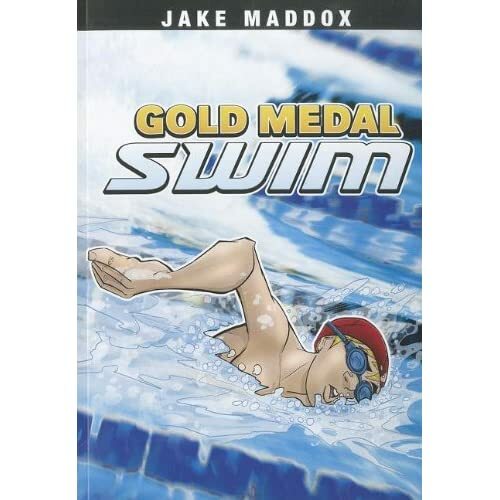 This easy-reader level 3 title shows what happens when Cork, a muskrat, teaches his friend, Fuzz, a possum, how to swim. Here's a sample as it appears on page 28: "Fuzz!" Cork yelled again. "Paddle!" Fuzz paddled. "Kick!" Cork yelled. Fuzz kicked. Paddle! Kick! Paddle! Kick! The context of this passage is that Fuzz accidentally fell into the water and is afraid of it. Parents of children who are afraid of water could use this passage as a discussion point.